Many bold souls have attempted to create the perfect all-bacon burger. While some put up an incredible effort (see: Slater's Bacon 'Merica Burger), they were still playing within the confines of a box. 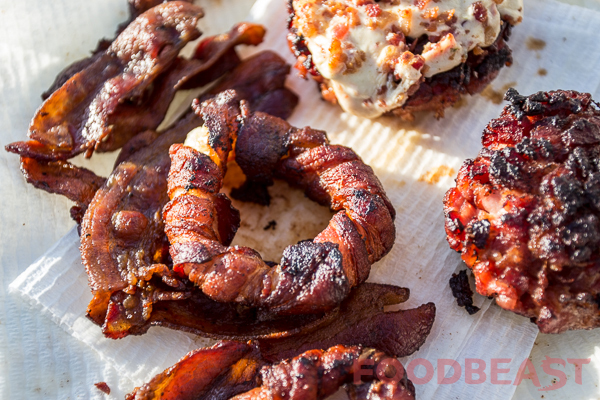 So, we here at Foodbeast were determined to create a truly 100% bacon burger -- from the bacon-infused bun to the bacon-wrapped onion ring to the bacon-crusted egg to the actual ground bacon patty (whew). 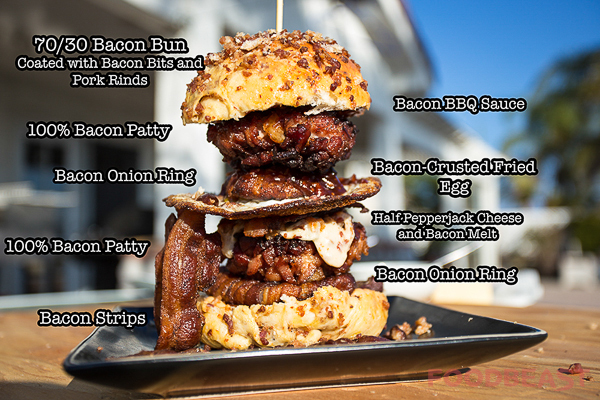 We've created a burger so epic, it'll fill your bacon cravings for an entire lifetime. 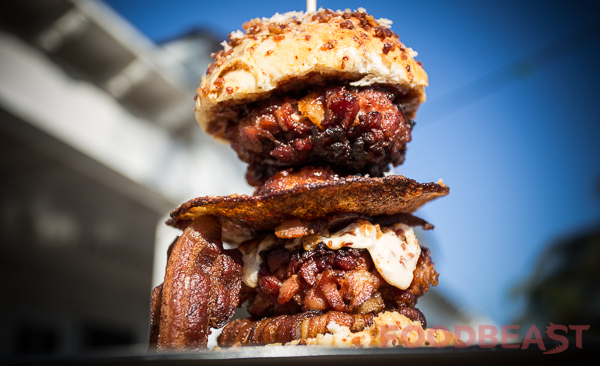 Ladies and gentlemen, we've officially jumped the shark pig and crafted the Truly 100% Everything Bacon Burger. Enjoy! bacon (at least 5 pounds). Combine milk, water, sugar and yeast in a cup and let stand for a few minutes. In a mixer, combine flours, salt and butter. Mix with a spoon until the the butter is in small chunks. Add wet mixture from earlier, with a beaten egg, to the dry. Start the mixer on low for about 10 minutes. You should have a sticky wet blob of dough. Shape it into a ball and set it aside in a bowl, covered for a few hours. It needs to rise. After the nap you just took, your ball of dough should have doubled in size. Slice off a fraction of the dough (you can use the rest to make regular burger buns). 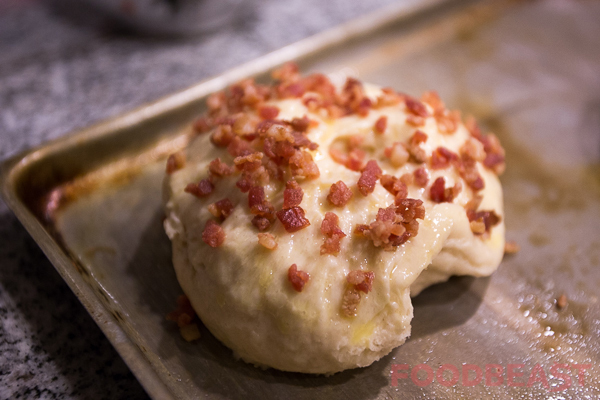 Add some crushed pork rinds and a some bacon bits to the dough and start flattening it and pitching the ends back until it forms a ball. You can do the same with the rest of the dough (minus bacon and rinds). Set aside for another couple of hours. Beat an egg with about a tablespoon of water to make the egg wash. Coat your burger bun with the wash.
Add a dusting of bacon bits to the top of your buns and throw it in the oven. At 400 degrees, bake your bun for about 15-20 minutes or until it's golden brown. Add some crushed pork rinds after buns are ready. Crumble pepperjack into a ball along with bacon bits and flatten so the bacon mixes with the cheese. Take bacon and divide in half. Cut up one half of bacon into small chunks. Take the chunks and squeeze them until you can form a patty. 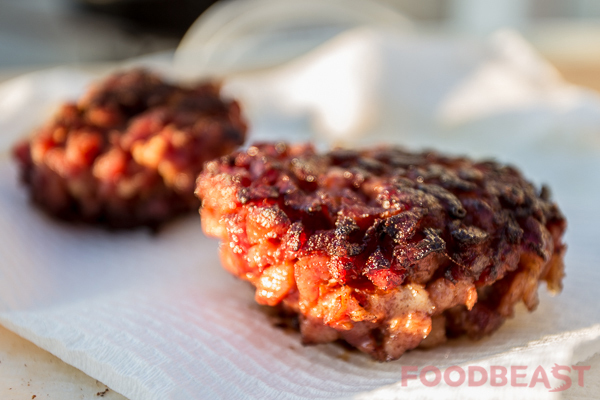 Fry the bacon patties 5-10 minutes on both sides on medium-high heat, until crispy. Careful not to break the patty. Add the cheese slices to top of the patty so it melts. 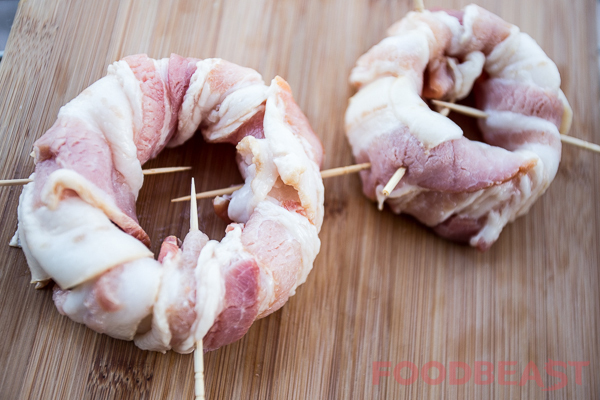 Cut onion into rings and wrap with uncooked bacon. Hold together with toothpick. Fry. Mix BBQ with bacon bit pieces and set aside. Separate egg whites from yolk and add bacon bits. Scramble egg whites with the bits and place on frying pan. 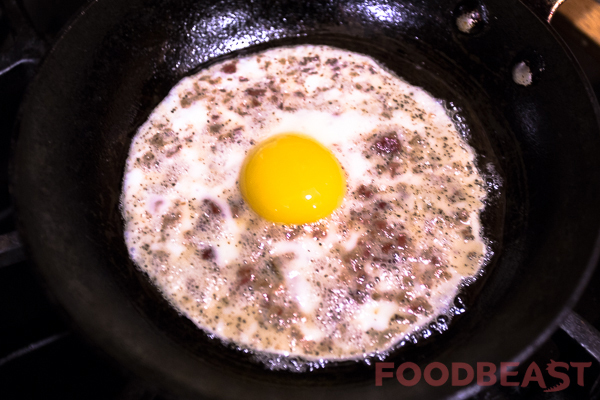 Add yolk to whites and cook on medium-low heat. Fry up remaining strips of bacon. Stack your burger however you want. Garnish with strips of bacon both in and outside the burger. Note: Drink plenty of water and have "9" and "1" pre-dialed on your phone while eating.